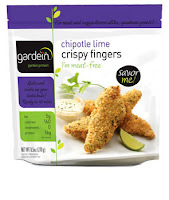 This week, I'm testing out another Gardein product: Gardein Chipotle Lime Crispy Fingers. To cook these, I popped them into a super hot oven (450 degrees F!) for the suggested time. It did take the full 25 minutes to get crispy - after 20 minutes it was still pretty soggy. However, after 25, it was really very crispy. I may even go so far as to say crunchy. While they were baking, they tasted very strongly of chipotle, and I began to get a little worried that they end up being too spicy for me. Something I'm going to highly recommend is to actually let it cool a couple minutes after taking it out of the oven. I was pretty impatient, and took a bite as soon as my mouth could handle it, and it tasted kind of blah. After a couple minutes, though, the chipotle flavors started to come through, and, to a lesser degree, a little citrus hint at the end. It turned out to be a good amount of spiciness (for me) - felt the burn a little, but didn't run crying for a glass of milk. (what do vegans drink when food is too spicy?) The spice increased as I ate more of the crispy finger, as chipotle tends to do, so be aware of that. I ended up dipping them into a little bit of ranch dressing, to help cool things down slightly. I can see these being very good in the recommended applications printed on the bag - a wrap or a salad. They're not super exciting on their own, but I think that, with other ingredients, the flavors would complement each other nicely. Hey everybody! Sorry for disappearing on you there for a bit! See, in case anyone was wondering, what happened is that I found out I am pregnant! (Yes, I'm a woman, for those of you not keeping track) And for a few weeks there, I wasn't up for experimenting with new foods, and then I just sort of got out of the habit, but I'm back now. My first review upon my return will be for Morningstar Veggie Meatballs. I ate these a long time ago, and have had the box sitting on my desk to remind me to write up a review, so forgive me if the experience isn't totally fresh in my mind. For the cooking method, I chose the oven, since that usually results in a better outcome. I heated them up as directed, then tossed them into the pasta sauce, to soak up some tomato-y goodness, before serving them with some spaghetti. Super classic. How were they? you are undoubtedly asking. Well, they were pretty good. They had a fairly chewy texture, but not tough. The flavor was not perfectly meat-like, but wasn't bad. I may recommend that the veggie balls spend a little more time with the sauce, to improve the flavor a little. Maybe even partially cook them in the oven, and finish in the sauce. Overall though, if I were not a regular eater of meat, I'd certainly eat these.